Mallorca is the largest of the Balearic Islands, located off the east coast of Spain, and it’s one of those destinations that offers something for every type of traveller, from beach bums and foodies, to hikers and cyclists. The island’s beauty comes in many forms so prepare yourself to be awed by rugged mountains, crystal blue coastline, quaint villages, rich history, and a cosmopolitan capital. Ready to explore? Here’s everything you need to know about taking a trip to Mallorca. From Palma de Mallorca Airport, your best option is to take the bus. Bus number 1 runs from the airport to Palma and from Palma to the airport, and the trip is only about 15 minutes. A one-way fare is EUR 5. There are signs for the bus once you exit the airport and once you’re at the bus stop just keep an eye out for Bus number 1, which comes every 15 to 20 minutes. Get off at Plaza de Espana in the centre of Palma, Mallorca’s capital. From here you can either start exploring or go further afield via bus or train. Taxis are at your disposal any time of the year, just in front of the arrival door after exiting the airport. They are metered and cost about EUR 30 to the city centre. You can book your taxi online in advance and obtain a good discount (for example with Balearic Transfer). The booked taxi drivers will welcome you at the “Meeting Point” of the Airport, in the middle of the arrival hall. Some hotels and tours offer a private transfer service for their clients. You can contact your hotel to ask if they offer that kind of service. Public transportation is an option in Mallorca, but the centre of Palma de Mallorca is too small for buses, so your best option is to get to the centre by bus and, once you get there, explore on foot. Taking a taxi is also an option, but the city centre is small enough to manage mostly on foot, making walking your best form of getting from point A to B when in the capital. If you’re not in the easily walkable centre of Palma you can take city buses (EMT) or use the Metro, which has two lines: M1 and M2. A single bus ticket is EUR 1.50 and a Metro ticket is EUR 1.60. Anyone wanting to travel further afield in Mallorca will need to get to Plaza de Espana, the main transportation hub of the island. Here you’ll find the bus station, train station and a Metro stop (Intermodal Station). Costs and times vary depending on where you’re travelling. You can check timetables for buses and trains here. You’ll want to spend a good chunk of time exploring Palma de Mallorca, the capital of the island. This is where roughly half of Mallorca’s population live and where you’ll find a good bulk of things to see, do, buy, and eat. No matter where you end up in Palma, make a point of spending some time in the Old Town — you’ll know you’ve arrived when the massive and imposing Gothic cathedral, La Seu Cathedral, enters your sightline. From here, get ready to wander aimlessly (and take tons of pictures). Streets here are too narrow for cars so you won’t have to share the winding, cobbled lanes with vehicles. Packed into not much more than one square kilometre you’ll find a plethora of cute cafés, quirky boutiques, bookshops, museums, bars, and restaurants. Art is also not hard to come by in Palma so save some time to check out some of the area’s museums and galleries. Make your way to and through Es Baluard Museum of Modern and Contemporary Art, where you can feast your eyes on works by Picasso, Miró, and Magritte, among many others. If Miró piques your interest, pay a visit to Fundació Pilar i Joan Miró a Mallorca, which exhibits a permanent collection of the artist’s work. In need of a little sunshine? With well over 200 beaches to choose from on Mallorca, it’s not hard to locate a stretch of sand worthy of your beach blanket. A great way to get a feel for the entire island is to take the vintage train from Palma to the pretty town of Sóller. The journey allows you to see some of Mallorca’s spectacular scenery including mountain ranges, countryside, olive and orange groves, and scenic towns and villages. Once in Sóller, plan to stay a while. There are a couple of beaches here where the water is calm and shallow and sun loungers are available to rent. 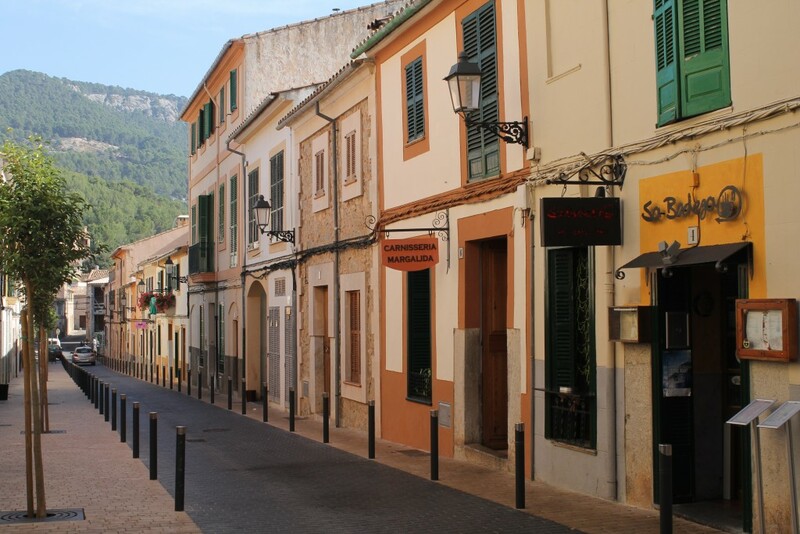 The area around Sóller is mountainous so hiking and mountain biking are also popular activities. In town, there are numerous shops and cafés to explore before heading back to Palma. There are also numerous bars and restaurants worthy of your time and money on Mallorca, but one spot not to miss is S’embat Ses Covetes, a cocktail bar and restaurant with a magic atmosphere and very good music. Located in Ses Covetes behind the beautiful Es Trenc Beach, they organise free concerts with local and international artists. Shows usually start around 9pm. If you want to have dinner, it’s a good idea to reserve a table in advance because this place is always packed. A good meal needs good conversation. And if we’re going to have that meal in Spain, that means our conversation should be in Spanish, right? Don’t worry, this isn’t your typical Spanish lesson — we’re going to skip the classroom and dig into a Mallorca-style breakfast while we learn the local language. Come discover the herbs of Mallorca… in a glass… in a drink made by you! Hierbas is the traditional liquor that’s loved across the island, and all the locals know the best stuff is homemade. Gather on a local’s home patio as the sun sets and brew your own Hierbas to keep — 100% natural and way better then what you’d buy at the duty-free shop! Get out of town and discover the Mallorca mountains! We’re taking you on a gorgeous Mediterranean hike, with visits to historical villages along the way and a panoramic view or two. Best of all, your reward for all that walking will be to kick back on a hidden beach, complete with a seaside picnic of authentic Mallorcan treats. Locals know the best nights in Palma de Mallorca are tapas nights! We’re meeting up with locals and taking you on a foodie adventure that’s filled with tasty tapas and perfect pinchos, and washing it down with local Spanish wines and beers. Making Paella: From Market to Mouth! Paella is more than just a meal — it’s a celebration! And we want you to celebrate this culture with your own special paella day! Join a local chef in his family home and learn how to make this famous Mediterranean dish. There are many movies shot on Mallorca, thanks to its diverse landscape of mountain ranges, coastline, and scenic towns and villages. One of the most recent being BBC One’s series The Night Manager starring Tom Hiddleson. Cloud Atlas starring Tom Hanks and Halle Berry was also filmed on the island. If you’re looking for some music to get you in the mood for a visit to Mallorca, you can try Concha Buika, who was born on the island. She sings a mix of flamenco and African music. Another option is the Majorcan band Antonia Font. Inspire your trip to Mallorca with a book set on the sun-kissed island. The Vacationers by Emma Straub about a family vacation gone awry is a good choice, as is the food-focused book, Bread and Oil: Majorcan Culture’s Last Stand by Tomas Graves. Looking for more info before you go? Contact us at info@mallorcaurbanadventures.com. You can also follow us on Instagram for live updates straight from Mallorca.